President Donald Trump tied a rising stock market to his administration. He mentioned rising stocks at every chance he got. Now he’s silent on a rapidly sliding market. There’s been no more consistent theme over President Donald Trump’s first year in office than his praising of a rising stock market and his efforts to tie it directly to his administration. But after mentioning stock market gains roughly 200 times since winning the presidential election in late 2016, including 25 times last month alone, Trump has gone silent on stocks as they posted a pair of their worst single-day point performances in history, falling more than 1,800 points. That juxtaposition has his opponents going after him. Former Treasury Secretary Larry Summers said it was “fair when people assign” Trump “responsibility for the decline” because of how much credit he sought for the market’s record gains. The commonly-held belief is that a president shouldn’t try to take credit, or at least, too much credit, for a rising stock market, since it opens them up to responsibility when the market falls, even though a president, in reality, has little to do with good or bad short-term stock market movement. “The President is not responsible for the stock market, but this is why it’s stupid for @realDonaldTrump (and @DonaldJTrumpJr) to try and take credit for gains,” Tommy Vietor, a former official in President Barack Obama’s administration, tweeted. And no president has tied their administration so closely to the market as Trump. “The reason our stock market is so successful is because of me,” Trump told reporters in November. The president has explicitly and implicitly claimed that the rising stock market, which repeatedly reached record highs in the 14 months following his election, was a result of his being in office. Trump repeatedly called for “the Fake News Media” to report more on stock market gains that happened since he took office, and insisted that the Republican tax reform package, passed in December, would lead to a continued market boom. And that’s just on Twitter. “So we’re very proud of our stock market, what’s happening since I became president,” he said. He even touted the stock market records during a speech to the Boy Scouts last summer. In recent weeks, he began promoting the idea that, had Democratic presidential nominee Hillary Clinton won the presidency, the stock market “would have gone down 50% from where it was” because he slashed regulations and she would not have. “And I will say this with great conviction, that had the opposing party won, in my opinion – because they would have added additional regulation to already the tremendous regulations we have – I believe the markets would have been down anywhere from 25 to 50%, instead of being up almost 50%,” he said in Davos, Switzerland at the World Economic Forum last month. Now, his administration is left answering questions about a rapidly declining market that Trump previously was touting at every possible moment. 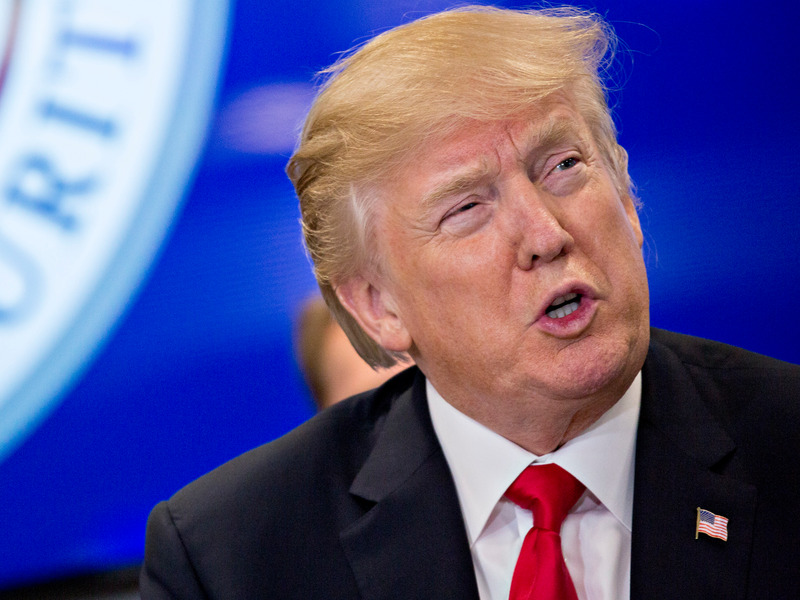 “What we’re witnessing is a case study in why a president shouldn’t brag too much about the stock market going up,” Rich Lowry of the conservative National Review tweeted. Trump’s advisers and spokespeople have insisted that the market’s fall is not an indictment of the administration’s economic policies. And whether it be deputy press secretary Raj Shah, press secretary Sarah Huckabee Sanders, Treasury Secretary Steven Mnuchin, or even Vice President Mike Pence, officials have all rallied around one talking point: The “fundamentals” of the economy remain strong. As Business Insider’s Bob Bryan wrote Tuesday, it’s not quite the same as when Republican Sen. John McCain infamously stated that the fundamentals of the economy were strong during his 2008 presidential campaign the same day Wall Street titan Lehman Bros. filed for bankruptcy. Wages are up, job growth is steady, and corporate earnings are still strong. But he noted that there are concerning signs, particularly regarding inflation and the subsequent fear of the Federal Reserve hiking interest rates. Additionally, the same tax cuts that Trump said would continue to boost the stock market may be contributing to its rapid fall, as The New York Times noted. Politically, though, that may not be detrimental to Trump, since that would be the result of rising wages. Wage gains are good for people who receive them, but bad for shareholders. Though some online appeared to have short memories when it came to a president touting the stock market, Trump is hardly alone in using the market as an indicator of economic success, even though no president has tied themselves as closely to the Dow Jones as he. “Good time to recall that in the previous administration, we NEVER boasted about the stock market – even though the Dow more than doubled on Obama’s watch – because we knew two things: 1) the stock market is not the economy; and 2) if you claim the rise, you own the fall,” Jay Carney, a White House press secretary under Obama, tweeted. While nowhere near as aggressive as Trump in trumpeting a rising market, it’s disingenuous to claim the former president “NEVER” tied his administration to the market. “I don’t have to tell you about the stock market and where that’s gone,” Obama said in 2014. Years later, right as his administration was nearing its end, Obama noted that the stock market “has nearly tripled” following his actions during the financial crisis at the start of his first term. He would note that the “stock market is hovering around its all-time high,” when noting the economic indicators that back up his argument that he handled the economy appropriately during his presidency. But a brief review of Trump’s years-old tweets showed that the current president certainly did not have any problem blaming brief stock market dips on a sitting president.